Every night at Craftland we are here for your art buying needs, but tonight is extra special. 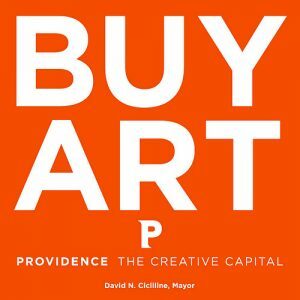 Join us to celebrate this year’s 5 Providence artists who have their images on the Buy Art Providence buttons. This year’s artists are Heather Annis, Maria DiFranco, Alison Paul, Quintin Rivera Toro, and Matthew Underwood. Come meet them, see their original artwork on exhibit, raise a glass, and of course shop for one-of-a-kind gifts at Craftland. Are you ready to have fun? RSVP on Facebook here and bring your friends! 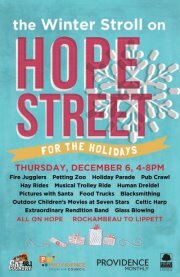 Come feel the cheer on Hope Street for the Holidays! This year’s stroll will be HUGE! Musical trolley rides, hay ride, petting zoo, food trucks, fire jugglers, The Extraordinary Rendition Marching Band, tree and wreath sales, Children’s Film Festival Outdoor, blacksmithing, glassblowing, carolling, pictures with SANTA, local celebrities, Human Dreidel, Holiday Parade, Bar Crawl and MORE! If you plan to take RIPTA to Hope Street, be aware Route 42 will be detoured due to the road closure. Also, Source at Reconstructure is having a thing from 6 – 8pm tonight with snacks and a “glass of merriment”.